In my most recent post outlining ten reasons why the global 2° C goal is more difficult than most commentators imagine, I referenced a new MIT report, Expectations for a New Climate Agreement, which looks at the prospects for the expected Paris COP21 agreement actually changing the current global emissions pathway. The findings don’t give a lot to be hopeful about, but nevertheless are worthy of further review. The work has been carried out by the MIT Joint Program on the Science and Policy of Global Change, a unique coming together of disciplines ranging from atmospheric chemistry to macro-economics, all under one roof. The team has developed considerable modelling expertise, which also combines the aforementioned disciplines to allow policy feedback to impact emissions and therefore the climate model itself. For the sake of transparency, Shell is a sponsor of the Joint Program. The first stumbling block the researchers hit in trying to assess what Paris might deliver was the current lack of detail or even a basic outline of the scope of the deal; this with just 15 months to go. While it is now widely assumed that COP21 will deliver a bottom up agreement based on contributions at a national level, there is almost no information available on accounting periods, review options, the nature of a contribution (e.g., reduction quantity, mitigation action, adaptation effort, financial aid, capacity building, technology transfer, R&D effort), terms of compliance, extension provisions and so on. Rather, all this had to be assumed, with the consequence of considerable uncertainty around the MIT findings. For example, MIT focus on a target date of 2030 for the first round of contributions, but continue the simulation of the effects of assumed contributions through to 2050. A reference case is presented which sits within the RCP 8.5 range, the equivalent of atmospheric concentrations of CO2 exceeding 1000 ppm over the long term. This represents a 4+°C scenario by the end of the century. Electricity generation is the single largest emitting sector in most countries and therefore features first in the resulting analysis. The MIT team argue that the majority of policy effects on emissions can be covered with just two options: controls on coal-fired generation and renewable energy mandates. In the case of coal, various regions and countries are assumed to pledge restrictions in coal generation, as outlined in the table below. Crucially though, large future users such as India are not expected to make a pledge of this type. Renewable energy is also expected to grow strongly, with the EU reaching a 35% share in electricity generation by 2050, with other regions following, albeit not as aggressively. In the transport sector, efficiency is the trend to watch, with vehicle efficiency improving by 2% per annum from 2020 in developed countries and by 1% per annum in the rest of the world. Similarly, in the commercial transport sector, a constant focus on efficiency in trucking fleets sees emissions between 10 and 20% lower than the reference case by 2050. However, the sector remains oil based for the entire period. Efficiency is also the major driver in reducing household emissions from the reference case, with developed countries leading the way and achieving a 20% differential by 2050. However, for other parts of the world this falls to as low as a 5% improvement over 30 years. Significant improvements are also assumed for land use change emissions and methane emissions. The effect of all this is noticeable, but growth in global emissions still continues through to 2050, although at a slower pace than the reference scenario. MIT have 2050 CO2-eq emissions at about 71 Gt, vs. their estimate of 56 Gt in the year of the agreement, i.e. 2015. This outcome is compared with two other projections in the figure below. One is the Reference case used throughout this analysis. 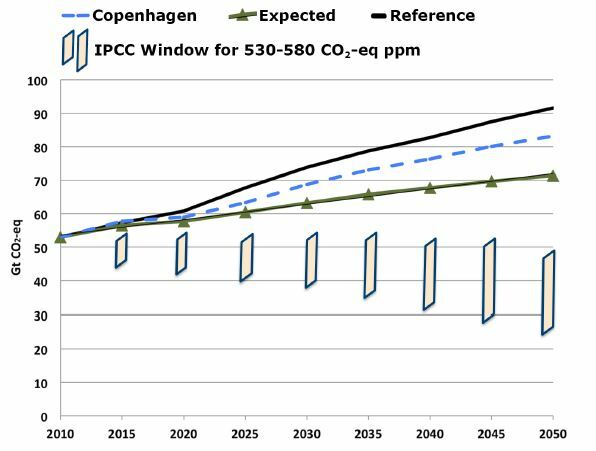 Also shown, for comparison purposes, is their estimate of emissions to 2050 if commitments made in Copenhagen are met in 2020 and sustained thereafter. By this analysis, the expected contributions from current negotiations will bring the nations part way toward an RCP 4.5 pathway (a median global temperature increase of 1.8°C over this century or about 2.6°C above the pre-industrial level) but will also leave much to be done in subsequent efforts. The issue of subsequent efforts and the nature of any review process is where the MIT analysis carries its starkest warning. The paper notes that if an agreement is reached in 2015, going into effect by 2020, the earliest review of performance along the way might not be before 2025. In this case, an effort to formulate the next agreement under the Climate Convention, or a tightening of COP-21 agreements, would not start until 2025 or after, with new targets set for a decade or more after that. 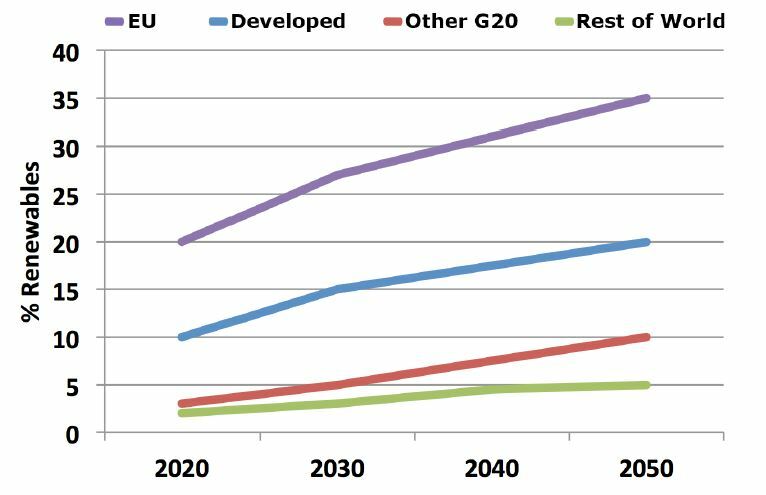 If this expectation is correct, then global emissions as far out as 2045 or 2050 will be heavily influenced by achievements in the negotiations over the next 18 months. Finally, the analysis calls for a common pricing regime as a preference to individual national actions conducted in isolation. The benefit here is a simple one, a lower overall cost for the global economy. Alternatively, for the same cost, greater ambition could be realized. Based on the MIT work it would appear that negotiators and their national governments still have a long way to go to be able to say that they have a deal and set of actions that is effectively dealing with anthropogenic warming of the climate system.